This past spring I opened an email to—“I know its last minute, but I got offered my photographer friends loft in the Marais for a week in June, I’ve heard its incredible, do you want to go?” And so we went! I've been to Paris many times, so this trip was not about seeing the mandatory sights, but more about exploring, wandering, just enjoying the days. The Marais neighborhood, located in the 3rd and 4th arrondissements on the Right Bank, is historic, charming and eclectic. Once home to immigrants, now home to art galleries, boutiques and hip restaurants, it’s a perfect place to meander, to just soak in Paris. “Our” apartment was in the 3rd, a few blocks north from the Place des Vosges. This area of the Marais, refereed to as the Haut-Marias or Upper Marais, is buzzy and happening right now. It took a long time: The Picasso Museum just opened after a five-year renovation - an absolute highlight that should not be missed. Want to do more than wander: Visit the Carnevalet Museum to trace the history of Paris…Literary fans head to Maison de Victor Hugo, the author’s house on the Place des Vosges turned into a museum…Art and architecture buffs shouldn’t miss the Pompidou Centre to view it’s collection of modern art and take in the high tech architecture of the building designed by Richard Rodgers and Renzo Piano. Shop: I found that the Marais has some of the best shopping in Paris. Wander the narrow side streets of Rue Charlot, Poitou, Debelleyme, Rue du Vielle Temple for well curated small boutiques. AB33 on Rue Charlot and Christophe Lemaire on Poitou are particular favorites. For the most comfortable shoes stop at Rivieras on Rue de Turenne for their canvas slip-ons. At Images et Portraits the collection of black and white vintage photographs are extremely impressive. If you’re into photography you can easily get lost here for a few hours. For fabulous Scandinavian furniture and home goods, check out Nordikmarket in the North Marais. A Great Concept: It’s a few blocks off the beaten track and you may need to ask for directions or use goggle maps as I did, but once you arrive you’ll love Merci! This beautiful store from the owners of Bonpoint, the luxury children’s clothes brand, showcases an avant-garde collection of interior and fashion finds spread out over three spacious floors. (Somewhat reminiscent of Colette on Rue Honore.) From classics to local young designers this is a concept store with great style. There is a casual café to grab a coffee or La Cantine that opens onto a small garden for a more proper lunch. (An added bonus of shopping here is that all profits go to a children’s charity in Madagascar.) The red cord bracelet with the dangling circle “merci” I brought back for my daughter a few years back is still on her wrist! Lunch Break: Head to Nanashi for healthy, flavorful Japanese influenced salads, soups and small plates. Or for possibly the best crepes in Paris try Breizh Café. (Also good late night for dessert) Marche des Enfants is the oldest covered food market in Paris named after the 16th century orphanage that originally occupied the site. It’s an atmospheric visit either to eat or just take a peek. About half the stalls are for ready to eat dishes—Italian, Moroccan, Lebanese and crepes to name only a few. I didn’t eat here, but the food looked good, and there are tables to sit at. Opening times vary by day so check before you go. Sugar Fix: Go to Jaques Genin, get the caramels and the pate de fruit. 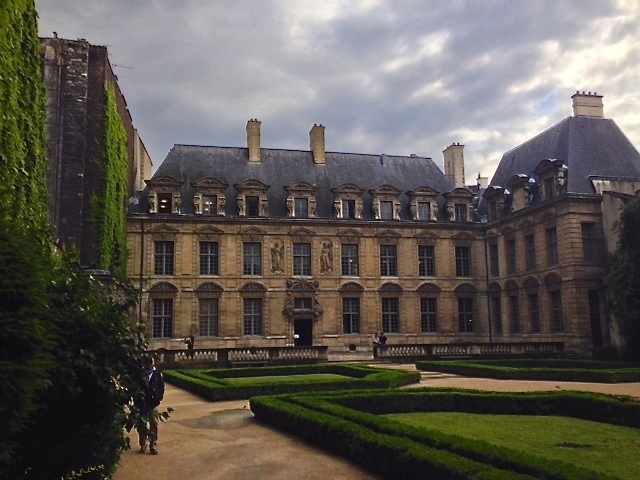 Stroll: After lunch you must walk over to the Place des Vosges, the oldest square in Paris, and one of the most beautiful. This is the aristocratic past of the Marais, the 17th century townhouses surrounding the square once the home of royalty and high society. If it’s a nice day the lawn will be filled with people and you may find yourself sitting and relaxing for a while. Carette, right on the square is a classic French café, sit and savor an afternoon tea or pastry. Discover: The Marais was a settling place for Jews fleeing oppression, and you can see the remnants of the once larger, but still active Jewish community on the streets bordering the Rue des Rosiers. 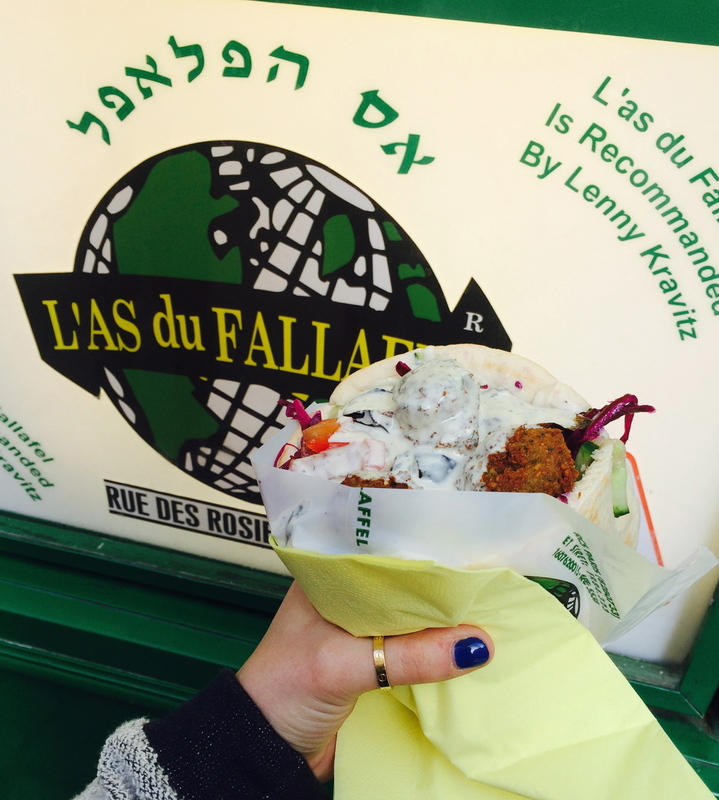 Perhaps the most talked about (and photographed) falafel anywhere in the world is here at L’as du Fallafel. Even if you’re not hungry it would be hard to walk by the outside window without trying their famous falafel sandwich, known even in Israel. (You can’t miss the restaurant, just look for a line at the outside green window) Perhaps if you’re with a few people you can share. Art: The Marias is home to many of Paris’ contemporary art galleries. Yvon Lambert, Emmanuel Perrotin, Suzanne Tarasieve, and Marian Goodman are all here in the Marais. Dinner: A friend recommended Chez Julian, a bistro overlooking the Seine for it’s steak frites and classic roast chicken, but after a few days of French food we headed to Chez Omar for delicious couscous and roasted lamb. With a no reservations policy the place can get quite busy so go early or you may have to wait.